Gospel Transformation is a 36-lesson inductive study focusing on what matters most; our need for the transforming power of the gospel. For small groups or personal study; it goes straight to the heart, exploring such issues as: repentance, forgiveness, the flesh, compassion, believing our justification, and much more. Now includes a Leader’s Guide in each edition! 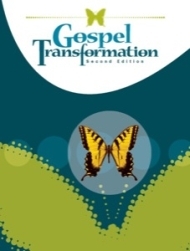 Gospel Transformation (Study & Leader’s Guide) is great for small groups, Sunday Schools, one-on-one discipling, Bible studies, and personal study. About the Author: Neil H. Williams (M.Div., Westminster Theological Seminary; D.Th., University of South Africa) is a writer and theologian residing just outside Philadelphia, PA. He has previously pastored in New York City and lectured in South Africa.